This document describes the installation of a Trip Computer to an XH series Longreach. This entails dismantling the trip computer, installing the front case to the XH console, refinishing the console, and assembling the trip computer. The plug for the trip computer is then wired up to suit. This is a supplement to the â€˜Adding a Trip computer to the EF/EL Falconâ€™ document http://www.fordmods.com/forums/documents.php?doc=32, which should be read first, and be used in conjunction with this document. 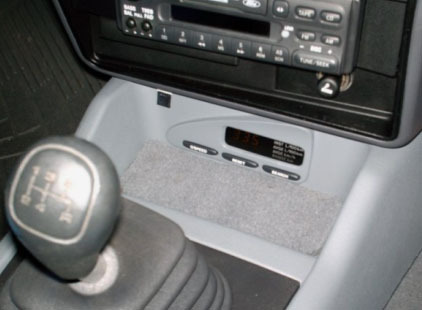 This is required for installing the front case to the XH centre console. 1. Carefully lift the retaining clips and separate the rear Trip computer case from the front. 2. Undo the 4 screws attaching the circuit board to the front casing. Remove the circuit board. Caution: Be careful not to touch the circuit board components, as static electricity may do damage. 3. Remove the clear plastic light diffuser. 4. Remove the LCD assembly, along with the colour filter, and front plastic insert. 5. Remove the overspeed, reset, and search buttons by carefully lifting the two retainers that hold each button, using instrument screwdrivers. Remove the buttons from the front. 1. 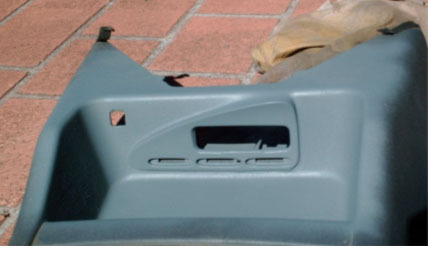 Remove the centre console: 2 phillips head screws are located in the rear console compartment base, and 2 phillips head screws are located under the front of the auto shift quadrant / manual trans shift surround. 2. Position the Trip computer front case on the front side of the console, position it centrally, or slightly favouring the left side, and trace the outline position. 3. Use the trace as a guide when cutting out the trip computer mounting hole. 4. Position the Trip computer front case through the mounting hole â€“ it will need to sit about 8-10 mm proud of the console, as when it is glued, it will be reasonably stiff and wonâ€™t flex. Excessive flexing will crack the body filler which we want to avoid. 5. Glue the front case to the console, by applying araldite around the join of the trip computer case and the console, on the console underside. This may need a number of applications. Before doing the below steps, ensure your working surface is clean, to enable all materials to stick properly. Metho, or better still, prepsol can be used to clean. 6. Use body filler to fill the front join of the trip computer case and the console, smoothen up by sanding to suit. This will need to be repeated a number of times to get the desired result. See Fig 1. below. Fig 1. Trip Computer case fitted and body filler applied. 7. 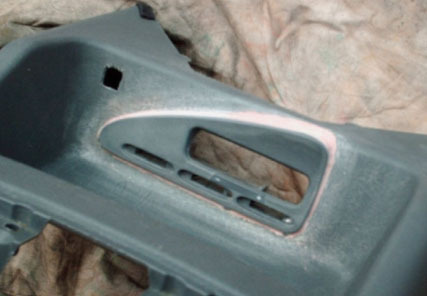 Apply plastic primer or a plastic primer/filler, apply a number of times and sand smooth. 8. When youâ€™re satisfied with the finish, apply another thin coat of primer, and while tacky apply a dry paintbrush tip to the area, to roughen the finish to simulate the console finish. 9. Apply a couple of light coats of vinyl spraypaint to the area. Then clean and spray the whole console to colour match, see Fig 2. below. 10. Assemble the Trip computer, which is a reversal of the dismantle instructions. Referring to the associated documents previously listed, this is a case of wiring the EF/EL clock plug to the relevant wires of the instrument cluster. The cluster surround will need to be removed to gain access to the cluster plugs, and the lower console cover (where the park brake is housed) will need to be removed also. * Indicates extra pins to be inserted into the clock plug â€“ hence the extra plugs mentioned in the Parts required section. Q: I donâ€™t understand, isnâ€™t there already a clock plug wired in â€“ just like the EF/ELâ€™s ? A: XH's never came from the factory with a Trip computer or clock - the clock was integral with the base series radio. So you need to wire in the plug + add the 3 extra wires to run the Trip computer, this is where the extra pins come in - so you get them from another clock plug, or an instrument cluster plug, because they are the same pins. Don't do what some people have done and push the wires in to the plug back, or glue them - do it properly 1st time, so you won't have intermittent wiring problems later on. Q: So how do I get the pins out of the donor plug ? A: The pins clip in to the plug with a plastic â€˜fingerâ€™ holding each pin in place â€“ if you â€˜dissectâ€™ your donor plug, youâ€™ll see how this is set up. Document written by: snap0964 on 19 2006>, Copyright © 2006 snap0964, all rights reserved.